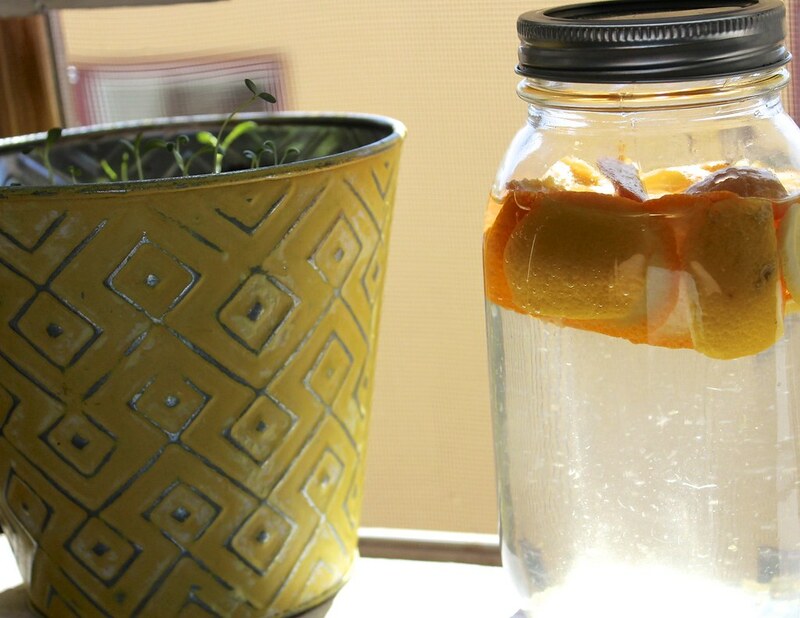 You can now make a natural, all-purpose cleaner with only fruit peels and vinegar. It works great, has no harsh chemicals, and smells divine! You can even get some aromatherapy benefits from these cleaners as well. There are two ways to make this cleaner, one if you need it today and one if you don’t need it for 2-3 weeks. Place all orange peels in a pot and cover with 1 ½ cups of vinegar and ½ cup of water. Bring to a boil for 5 minutes. Then, let simmer for about a half an hour, stirring occasionally. Let mixture cool to at least lukewarm. Then, place sifter, strainer, or nut milk bag in a bowl. Pour the mixture in the filtering utensil to catch any of the pulp in the vinegar/water mixture. Pour the mixture from the bowl into a jar for storage. When you want to use it, fill up the spray bottle halfway with the vinegar solution. Top the other half off with water. You are all set! Feel free to use on windows, glass, counters, and floors. The vinegar smell will fade within minutes of use. Place orange peels into an airtight glass jar. Fill up the jar with vinegar. Close the jar and let sit for 2-3 weeks. When ready to use, fill the spray bottle halfway with the vinegar mixture using a funnel and strainer to keep out the pulp. Then fill the other half of the bottle with water. You are ready to clean! Feel free to use on windows, glass, counters, and floors. The vinegar smell will fade within minutes of use. You can mix up the citrus fruit you use and add herbs and spices if you wish! The shelf life is just about forever; hopefully, you’ll use it before then! This alternative is natural, cheap and sustainable. Plus, you can get aromatherapy benefits from this product as well! Orange will lift your mood, ease your pain, and give you energy. You can reuse your food waste for so many things, this is just one example! If you give it a try, comment what mixture you decided to use!